There are SO MANY THINGS to tell you today. First, yesterday was huge. If you like Life As A Strawberry on Facebook (which, um, you all should) you know that YESTERDAY I broke my record for most single-day page views! Over 1,300 people looked at my recipes yesterday, and I gotta say, numbers like that feel pretty.darn.good. Granted, I have nothing to compare it to, and I’m sure most of the more well-established bloggers out there would trounce me numbers-wise, but still. NO RAIN will be found anywhere near my parade. The next thing you should know is that I make THE BEST mac and cheese. Ever. That’s not bragging – it’s the truth, confirmed by nearly everyone I ever hung out with on a Saturday night in college and all my immediate family members. 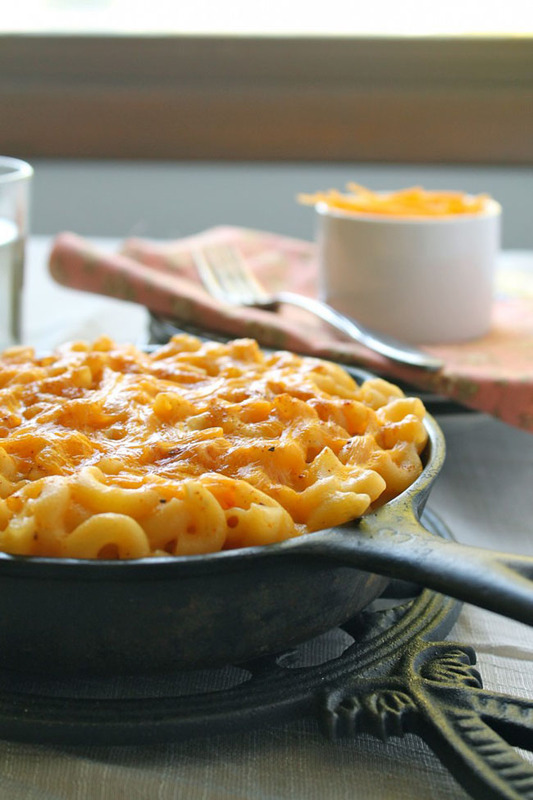 Mac and cheese is also my FAVORITE kind of comfort food – warm, simple, and oh-so-delicious. 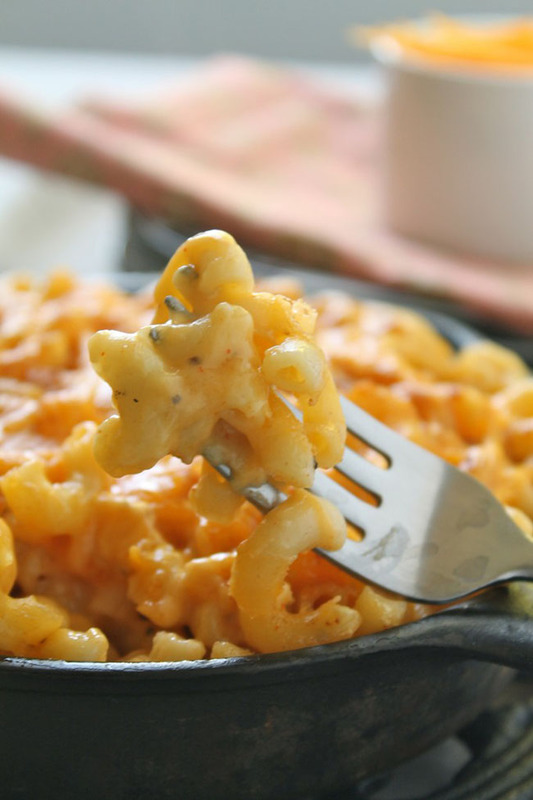 So I got to thinking – I should spend some time honoring the awesomeness that is macaroni and cheese. So, friends, I officially welcome you to the best idea I’ve ever had: THIS is MAC AND CHEESE WEEK. Get ready for five days of twists and turns on a classic. It will be excellent. 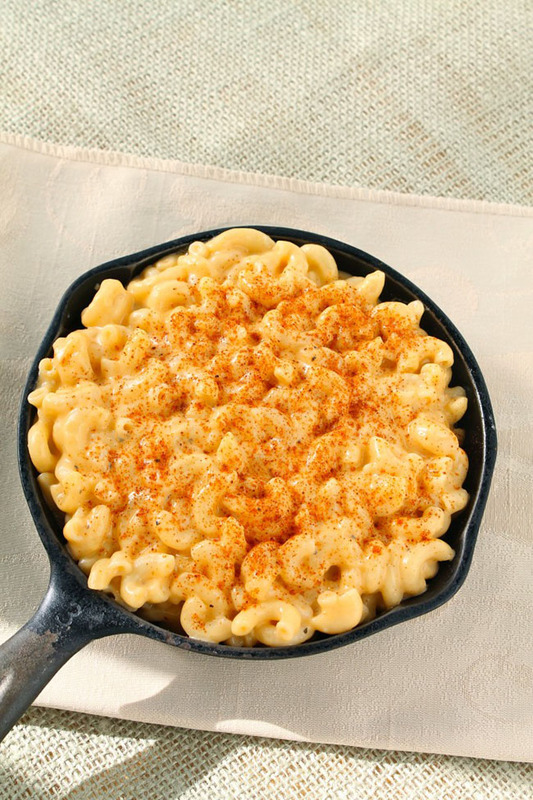 So, to kick it all off, let’s start with my classic recipe: spicy mac and cheese! It’s got a light kick and great flavor, and soon it’ll be a regular on your weeknight rotation. Cook pasta according to package or recipe directions (I use VERY salty water) until it is a few minutes (6 min. 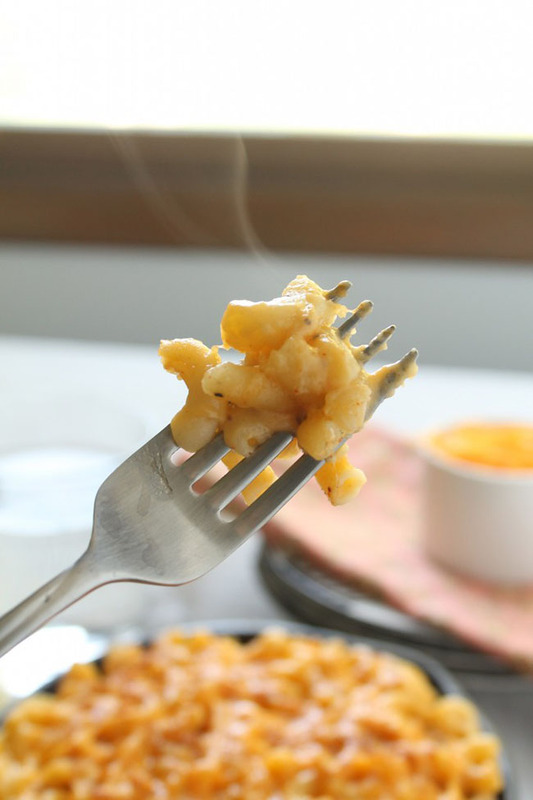 are usually good) less than al dente – the pasta will continue to cook in the oven, so having very al dente pasta when you put the pasta in to bake will ensure your macaroni isn’t mushy or overcooked! In a large saucepan, melt butter. Whisk in flour to make a roux and cook for 1 minute. Whisk the milk into the roux a little at a time, making sure to work out all the clumps so you have a smooth sauce. Cook over medium heat until milk has thickened, about 8 minutes. Remove sauce from heat. 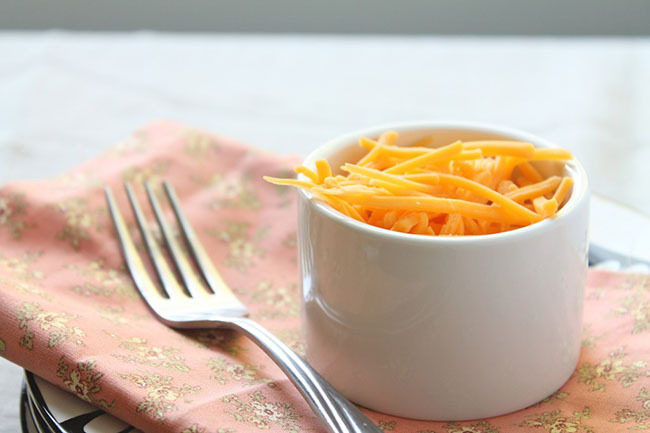 Stir in 2 and ⅔ cups of the cheddar cheese with a spoon or spatula. Stir until cheese is melted. Stir mustard powder, cayenne, paprika, and black pepper into sauce. Stir pasta into sauce. Take a bite. Pat yourself on the back. Bake at 350 for 15-25 minutes or until cheese has melted and edges are crispy. MACARONI AND CHEESE WEEK LINEUP!! I made this recipe tonight for my family and it was an absolute….. ABSOLUTE hit! Thank you for sharing it. Wahoo! I’m so happy you liked it, MaeAnn – thanks for letting me know how it turned out! This recipe looks great! How well does it do if you make it the day before a party? Or any suggestions if I would like to make it before. Thanks! It holds up great when you make it in advance! 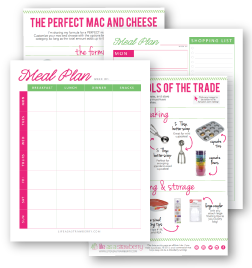 I just assemble everything, cover it with an airtight lid or tinfoil, and put it in the fridge until ready to bake. I find it works best when I take the cold dish out of the fridge and put it into a COLD oven, then preheat the oven with the dish inside. 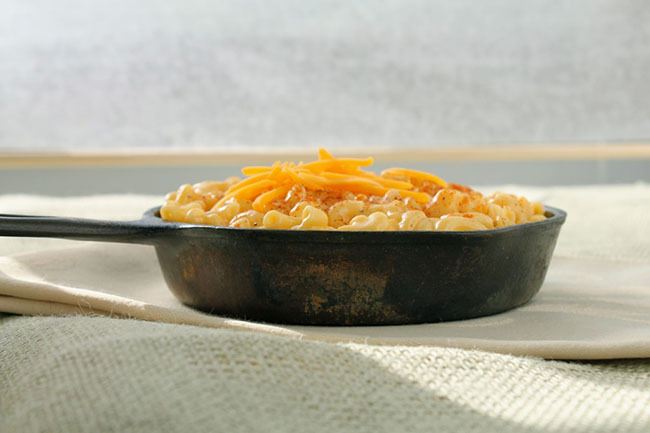 By the time the oven is heated up, the mac and cheese is warmed through and only needs a few more minutes to get nice and crispy on top. Hope that helps! tosssed in the bin !! 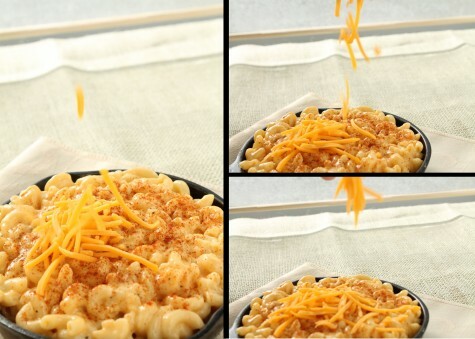 I’m so glad you liked the mac and cheese – thanks for letting me know how it turned out! I’d love the macaroni ‘n cheese recipes sent to my email address above. Thx!!! Anyone who knows me, knows I can’t cook. I stumbled upon this page and the pics along with your detailed instructions tempted me to try it. I made it and I couldn’t believe that I made delicious mac and cheese! My husband was even surprised that it yummy! Thanks for your recipe!!! I’m so happy to hear that! Thanks for letting me know how it turned out! Made this tonight, my kids loved it. Though a big part of me wishes I made mommy a special white pasta batch and been even naughtier. Delish. I’m glad you liked it! This is my most-requested recipe at potlucks. Thanks for letting me know how it turned out! I made this tonight and am sorry to say, I was very disappointed. It was dry; the ratio of pasta to cheese sauce was way too high. 1/2 lb. of elbow macaroni would’ve made it perfect. 1 lb was way too much. Was that a typo by chance? Also, 1 lb. makes enough to feed an army–a lot more than four servings. I filled an entire 9×13 pan with mac and cheese. It’s easily 8 very generous servings, not 4. I’m so sorry to hear that this recipe didn’t work for you! There were no typos, though – this is the recipe I use on a regular basis, and it has always been well received. Personally, I don’t love it when pasta is swimming in sauce, so my recipes are never meant to drench the pasta. I know many people who do like a pool of sauce in their pasta dish, though, so if that is the case I recommend adding 2/3 cup or so more milk to the sauce and an extra handful of cheese. Since I’m not in the kitchen with you, it’s hard to say why your mac and cheese turned out differently than mine does from the same recipe. But what I can do is help you troubleshoot to figure out what may have happened! In my experience, there are a few different things that could cause this recipe as-written to be dry. If I heat the milk for too long, the sauce will thicken too much and I won’t have enough to coat the pasta, which causes some dryness. If I add too much cheese to the sauce, that will also result in a too-thick sauce that will yield the same effect. In this recipe, it’s important to reserve the designated portion of cheese to top the pasta, rather than adding all of the cheese called for to the sauce (I have a note about this in the recipe directions). The other thing that can cause a dry mac and cheese is overbaking. If I leave it in the oven too long it will dry out. This can especially be a problem when I make the pasta in advance and refrigerate it until I’m ready to bake – I counteract this problem by adding an extra 1/2 cup or so of milk to the sauce to account for the amount of sauce the noodles will soak up as it sits. Did you find the pasta too dry before or after you baked it? If the sauce ratio was fine before baking (which in my experience, it always has been) then I might suggest a shorter baking time or that you bake it in a deep dish with less surface area. I rarely bake this pasta in a 9×13 pan because I find that the thinner layer of pasta is easily overcooked, especially if I’m not paying close attention to the oven. But that’s just me. With regards to the serving sizes, I apologize if my recommendation was misleading. In my family, I make a pound of pasta and it’s perfect for four of us. However, when we have mac and cheese (or any pasta dish, really) it’s usually the only thing we eat. No side dishes or salads or anything. If you served this pasta alongside other dishes, then your per-person serving of pasta would of course be smaller. For us, we each have a large bowl for dinner and usually end up with few or no leftovers. But every family is different! I hope that this helps and that you will come back and try a few more recipes! Hi Jessie, Thanks for your detailed reply. It was dry before I put it in the pan for the oven, while I was mixing the pasta into the sauce. I did reserve the cheese for the top; in fact I added more cheese to the top because it was too sparse to cover the 9×13 pan. I used a 9×13 pan because I didn’t have anything else that could hold all that pasta. You must have a large 12-14 inch cast iron skillet. 😉 I baked it for 15 min and my oven thermometer registered 350, so the oven wasn’t too hot. Anyway, my guess is we just have different preferences on the ratio of sauce to pasta. I plan to try it another time and just halve the amount of pasta. The sauce had good flavor when I tasted it before adding the pasta. But it became a very thin layer when spread across all that pasta so it didn’t have the ooey-gooey goodness I love about mac and cheese. I did serve it as a side with rotisserie chicken and spinach. It would still be a very large serving in my opinion as an entree, but everyone is different. Thanks for the reply. I’ll try it again sometime with less pasta. Looks perfect. And I love that it’s spicy and kinda healthy… carbs — I’m coming for you. Mac and cheese for 5 days straight? SUCH an amazing idea! 🙂 Although, I’d be a bit frightened by how much my hips would expand by the end of the week 😀 That’s what happened to me after I started my cookie project! But so worth it! 🙂 Also, congrats on your page views! Amazing recipe, but I’m not sure where to get a cast iron skillet. I know it’s not needed, but I’ve seen loads of people lately using these in their recipes and was curious as to how I could get my own! May I know where/how you got yours from? I actually got mine as a hand-me-down, but I see them on special at Sur La Table, Bed Bath and Beyond, or Crate and Barrel pretty frequently. Thrift stores will also have good cast-iron skillets pretty often – they look a little beaten up, but this is a great tutorial on how to restore and reseason an old cast iron pan: http://snarkyvegan.wordpress.com/2010/12/05/how-to-restore-an-old-and-grody-cast-iron-skillet/ . Hope this helps! Jessie this looks great! I’m going to try it out tomorrow!